This is Eagle Girl, she is a flight risk, must be closely watched. 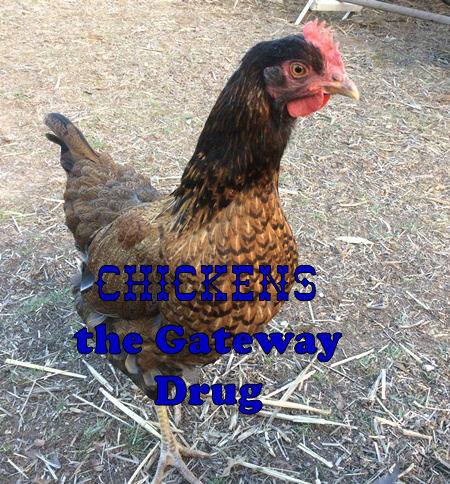 So it is said that chickens are the gateway drug to a more sustainable life. Is it true.... yes i think so, the temptation of all those lovely fresh eggs and how easy chickens are to come by and care for they are usually the first thing people get into even before doing a veggie garden. I first got chickens in about 2001, 2 Rhode Island Reds and 2 Austrolops. I have come a long way from those first chickens and have learned so much. You don't need a farm to raise chickens, the suburban garden is all you need. If you have decided that chickens will be coming to your place, what do you need. i still love this coop. The chicken coop is your first port of call, whether you want a big old coop, a small chicken tractor a converted cubby house or a transformed cot (yes i know someone who turned a cot into a coop) its up to you as long as it can be secured, we don't want your beautiful hens killed and eaten on their first night. As far as this goes we have had Foxes and Quolls who have taken our chooks, don't be fooled into thinking just because you live in suburbia your chooks are safe. If you choose a tractor then you are all set as far as housing goes, however if a coop and a run is more to your liking then there is a little more work to do. This is The Big House, the first coop we built here on the farm. You can either build a coop or buy one already built, then its a matter of putting up a fence for their run, even if you want to free range in the rest of your yard you will still want a run for when you don't want to have them out and about. I always like to use an old wooden ladder as it makes it easy for them to get up to the top perches. When building your coup you will need to put in some roosting branches as chickies love to roost at night. I find tree branches are good for this as they are not uniform in size and being round make it easy for them to hang on to. Eagle Girl trying out the new nest box. Next you will need a nest box, now these can be pretty much anything, a wooden box, a crate, a mower catcher or anything else you can knock up. If there is a roost above where you put your nest then you will need a roof or cover or it will end up full of poop. Add a little straw, sugar cain mulch or any other dry grassy material to the nest, any of these can also be used on the floor of the coup. I also add in green pine branch needles, rosemary and lavender. For feed and water dishes there are any number of things you can use in and outside the coup. i always have water in and out side the coop, however i only have their dry feed in the coup. All the food scraps, garden leftovers and breakfast mash is fed outside. Chickens only like fresh clean water to drink and for that reason i use open bowls or dishes as i have found the enclosed ones get green very quickly and they can be a pain to clean. To their inside water i add 1/4 cup of Apple Cider Vinegar once a week. There is a saying "rare as hens teeth" because chooks don't have any teeth, so they need to eat small stones and shell grit to grind up their food. In this case they will need a dish of medium shell grit available at all times. What feed you provide is up to you, there are a few options to choose from. Pellet feeds are popular and easy, then there are the scratch mixes, which sometimes are a waste as they only eat what they like and leave the rest. You can also make up your own dry feeds. For our lovely ladies and handsome fellers we feed a combination of different feeds. Cracked corn, wheat, barley and sunflower as a dry mixed seed in a treadle feeder in the coop. Fermented wheat and sprouted grain and as many kitchen scraps and garden waste as they can eat. The wet food is always fed outside in big dishes. This is fermented wheat, it is soaked for about a week where it gets lovely and soft and gets a nice yeast-y smell. This is Chick eating her sprouted grain. As a mash in the mornings or late afternoon when its cold, rolled oats, milk/yogurt, chopped up greens, garlic powder and anything left over from the night before all mixed up with a bit of hot water, once a week i also add in a bit of seaweed powder. In return for all of this our girls lay us yummy sunny yellow eggs. the blue/green eggs are from our ducks. Besides the fact that these beauties will clean up your garden, eat all your veggie scraps and in return they lay wonderful tasty eggs they are also entertaining and funny to watch and each one has its own personality. This mean guy came in at just over 2kg and tasted delish. What about a rooster you might ask, well you don't need a rooster to get eggs but you do if you want some chicks. It was definitely a gateway drug for me. Chickens are so versatile, so easy to care for and really fit well on our landscape. Where larger livestock presented more of a challenge on our slopes. I enjoyed reading your post, and nodded my head more than a few times. Build a coop out of a cot, check! Ferment grains for feed, check! Make a warm porridge out of last nights leftovers, check! But you know, I'm always plotting the next new challenge with the chickens - something new to help our co-existence more integrated. It was great seeing what you've been up to, and the new coop. Any plans for larger livestock?